Government projects costing respectively £1,436,162 and £30,417 miraculously shrink when MPs are formally told about them, to become a mere £543,816 and £5,800 – "losing" nearly a million pounds in the process. Welcome to the second instalment of our look at the bizarre world of climate change politics, where nothing is what it seems and governments indulge in behaviour which, in other circumstances, would look very much like money laundering. In our first piece, we introduced a new character to our growing cast of players – a certain Dr Andrew Reisinger. For his pivotal role in furthering the ambitions and interests of one R K Pachauri, he ought perhaps to be better known than he is. We can see these two figures together – or at least at the same venue – on 8 November 2004, where they were both at the 32nd Session of the IPCC Bureau, held in Pachauri's adopted home town of New Delhi – a city which Reisinger was to get to known extremely well. It was at that meeting, way back in 2004, that Pauchauri presented the Bureau with his "final proposal on scope and content of an AR4 Synthesis Report (SYR)." His outline was complete with "Options for a schedule for preparing an AR4 SYR and for managing the process, including resource implications." Throughout the proceedings, Andy Reisinger was there on behalf of the New Zealand government, styling himself as belonging to the Climate Change Office, Ministry for the Environment. He was, however, doubtless fully attendant on the man who was a few years hence to become his boss and co-worker, Dr Pachauri. The opportunity for Andy to jump ship was created the following year in Montreal when between the 26-28 September 2005 the full IPCC met in its 24th Session to discuss a report, submitted by Pachauri on the "Management plan for the AR4 Synthesis Report." It says something of the persistence if Pachauri that the issue had already been raised at the 23rd Session of the IPCC held in Addis Ababa on 8 April 2005 (at which Reisinger was again present), when "progress" had been made. The issue had been referred back to the Bureau in its 33rd Session also held in Addis Ababa, the record of which is curiously missing from the public domain. This had been followed by an "extremely helpful and effective meeting" held in Baarn, the Netherlands, on 7-8 July 2005. That then, set the scene for the IPCC meeting in September in Montreal where Pachauri was able to set out to the management team his full plans for the production of his synthesis report, complete with costings and the formation of a Technical Support Unit (TSU). Then, he was able to tell his colleagues that it was "anticipated that the total cost of this TSU Head, including travel etc., would be taken care of by the Government of the UK." Quite when this was agreed, we do not know – still less do we know on whose authority it was agreed. But the deal had been done. The Management team was also "grateful to learn" that the two individuals to assist Pachauri, "kindly supported by the Government of India", were available to work in New Delhi. This, it was "felt", was the most desirable location for the TSU. Reflecting possible dissent, however, Pachauri conceded that the "next best location" would be Exeter. Apart from the generosity (albeit unknowing) of the British and Indian taxpayers, Pachauri told his team that the estimated expenditure for preparation of the synthesis report over a period of three year - 2006-2008 - would be about £400,000. That included a sum of about £250,000 for publication and translation, leaving £150,000 for preparation – this for a 52-page summary of the main report. Although, famously, Pachauri, was to say that he was not paid for his part in the report, the contract for "Layout and Graphics Design Support" was to be awarded to TERI Press - and, no doubt, there was an "overhead" component to the sums paid for staff. Evidently so confident of the approval of his management team that on 21 September – a full five days before the start of the Montreal meeting - Mary Jean Burer, an official at the World Meteorological Organisation (WMO) in Geneva, was already circulating an e-mail advertising the vacancy for an "IPCC AR4 SYR TSU Head". The appointment was for 24 months beginning 1st March 2006, the "compensation package" commensurate with the qualifications and experience of the person selected. This, of course, was the job for which Reisinger successfully applied, and its was then the job of the UK government to pay for him. This it did in an extremely round-about way. Tucked into a wider project to fund a "IPCC Technical Support Unit for Working Group II" – which it appears the UK also funded – is buried a reference to "support for ... preparation of the IPCC AR4 Synthesis report." The combined cost, financed from DEFRA, is an eye-watering £1,436,162 – paid to the Met Office. There is, of course, no breakdown of the apportionment of costs between the two different projects. And, to get round the inconvenient fact that Dr Reisinger was working for IPCC, he is put on the books as a "contractor at the Met Office." According to a post-project report produced under the Freedom of Information Act, however, things do not seem to have gone entirely to plan. 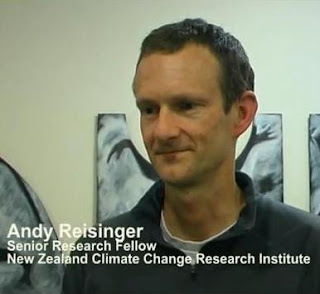 Dr Andy Reisinger is indeed employed as a contractor at the Met Office. But, we are told, this [only] involved provision of salary, accommodation, travel and subsistence and other work-related costs, within the period 18th April to 31st December 2006. After that, the TSU moved to New Delhi to be based close to Pachauri. To the casual reader, this would seem to be the end of it. Apparently, Andy is off the books after 31 December 2006. But then there is that extraordinary payment of £30,417 to TERI Europe, which we explored yesterday - in addition to the money already paid. In the interests of "accountability," however, these payments are notified to Parliament – sort of. They are tucked into a list of climate change projects worth £19,751,686, in a longer report entitled: "Ongoing Research and Development". The report is created on 21 May 2008 and the project coded GA01087 which actually cost £1,436,162 is entered at £543,816. The £30,417 paid to TERI Europe, coded GA01095, miraculously shrinks to £5,800. Nearly a million has gone adrift. How much more money, under what headings, and from what sources, flowed through the system, is thus unknown. How much ended in the pocket of Dr Pachauri – or in the coffers of his beloved TERI – we have no means of knowing. But then the whole point of money laundering is to conceal sources, recipients and flows of money. If this wasn't money laundering, then it bears a very great similarity to it. Despite his belief that speaking to the media "is a fundamental right for university scientists," it is no wonder that Dr Reisinger refuses to talk about it.